Lorna is the author of the best selling book, Walking the Journey Together … Alone, Finding Peace, Hope, and Joy in the Middle of Sh** which has been sold and making a difference in the lives of people in North America, Europe and Australia. 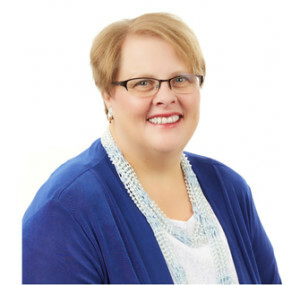 With over 25 years experience helping people through tough times, Lorna now helps family caregivers learn how to cope with day to day and long term responsibilities of caring for a loved one and learn to live with more joy, peace and build loving relationships with themselves, their loved ones and family. In addition to the wisdom in the book, Lorna draws on her knowledge and skills in personal development and achievement to help family caregivers face their fear of the future,feelings of overwhelm and loneliness, and losing a sense of their own happiness. 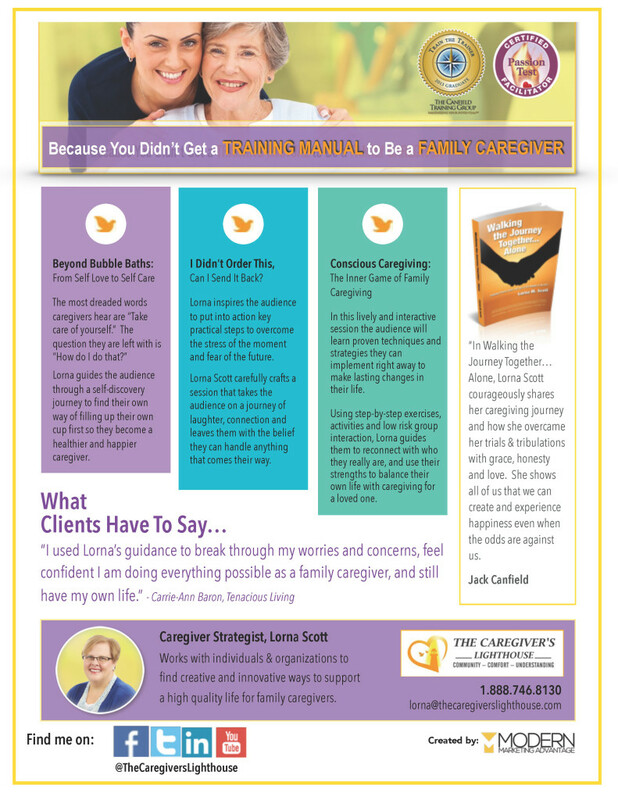 Lorna uses her personal story and lessons learned to share tips and strategies any family caregiver can use. Lorna is a genuine, empowering and compassionate speaker, coach and trainer/facilitator who has helped hundreds of people cope with unexpected and unwanted life changes, making tough decisions and finding positive solutions. Lorna is no stranger to stepping up to help out. When the call came, she didn’t hesitate to join other Canadian Red Cross and American Red Cross volunteers in New York City to help with the disaster relief efforts after 9/11 terrorist attacks. She was a valued member of the Canadian Red Cross B.C. Fires disaster relief team assisting families in Barriere, British Columbia. After Callum was diagnosed with rectal cancer, Lorna said “If I’m going to be part of the world of cancer, I want to be a part of making a positive difference.” She went on to become a local grassroots leader for the LIVESTRONG Foundation, founded the non-profit Saskatoon Supporting LIVESTRONG Cancer Corp., planned The Giant Colon Tour education day, and was selected to take part in the LIVESTRONG Foundation Global Cancer Summit. She is a member of both the Caregiver Coalition of Southeast Alberta and the caregiver advisory committee for the national project, Mobilizing Action, Family Caregiving in Canada. She is the founder of The Caregiver’s Lighthouse and Accelerated Success Consulting and has worked in in front line work and supervisor/management in counseling, crisis intervention, 9-1-1 emergency dispatch, coaching, education, adult training, and program development. Lorna has appeared on local and provincial television programs, is host of the weekly Internet radio program A Graceful Journey, was featured in Reader’s Digest (Canada) has published various newspaper articles, and been a contributor to other published caregiver books. A new Internet radio program aimed at caregivers will have its debut tonight. A Graceful Journey Radio Show, powered by Tenacious Living Radio, will be hosted by Lorna Scott, Medicine Hat resident, who wrote Walking the Journey Together … Alone, Finding Peace, Hope and Joy in the Middle of Sh**. The book tells of her experience caring for her husband who had terminal cancer. During her personal transition and transformation following his death, Scott became passionate about the plight of caregivers. Scott says the radio show is about conversations, insights and knowledge to help family caregivers. She brings her personal experience to the table combined with professional expertise as a coach and counsellor. Scott chose the 9 p.m. slot because she is hoping many caregivers will have their loved one already in bed and possibly have a chance to sit down and relax for the program. Each broadcast is about 40 minutes long. Over the next five weeks Scott will be covering what she calls the “Peace Formula”. “It’s something I’ve created myself to help caregivers get some focus and planning done to create what they want in their life,” said Scott. Medicine Hat, Alberta —August 31, 2015 — On Wednesday, September 2, 9 p.m., Medicine Hat, Alberta resident, author and caregiver, Lorna M. Scott, will be airing A Graceful Journey Radio Show, powered by Tenacious Living Radio. A Graceful Journey Radio Program is where listeners will hear powerful conversations, insights and knowledge to help them when family caregiving calls. Host Lorna M. Scott brings a powerful combination of experience as a family caregiver and professional expertise as a coach and counsellor. Listeners and family caregivers will be empowered to meet the demands of caregiving and find balance in their life, all while caring for themselves and finding grace, peace, hope, and joy in their journey. Share the wisdom she gained as a caregiver and some tips on how to be a caregiver who is filled with passion and love. Invite guests to join her to discuss issues meaningful and valuable for family caregivers. Bring caregivers up to date information and news about research, trends and announcements about family caregiving. Premiere Episode: Wednesday, September 2, 2015, 9:00 P.M.
Lorna M. Scott is a successful and creative leader and author with a powerful message of passion, hope and healing. Lorna is the author of the best selling book “Walking the Journey Together … Alone, Finding Peace, Hope, and Joy in the Middle of the Sh**. She is the founder of Accelerated Success Consulting and creator of the Achieving Success Training Programs and Caregiver Mastery Programs.Lorna found her passion helping others discover their own inner power and special gifts. During her personal transition and transformation following the death of her husband, she became passionate about the plight of the caregiver. Her personal philosophy is to have a positive outlook on life with a focus on solutions, not problems. She firmly believes that with the right information, attitude, focus and a belief in oneself, anyone can achieve their highest goals. Lorna knows that these are the keys to unlocking success and receiving the greatest gifts as a caregiver. In Walking the Journey Together…Alone, Lorna shares the trials and tribulations she experienced as a caregiver––juggling the demands of a terminally ill husband, her children’s needs, and her career responsibilities. Over a period of six years, she learned valuable lessons, particularly those on giving herself a little bit of her own attention and learning to ask for help. 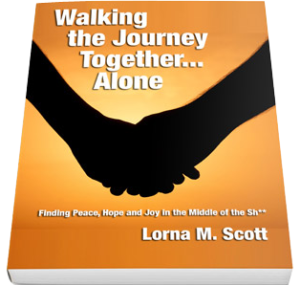 On April 5, 2014, Medicine Hat resident, author and caregiver, Lorna M. Scott, will be celebrating the release of her book: Walking the Journey Together … Alone, Finding Peace, Hope and Joy in the Middle of the Sh**. Reassess your “to-do” list and create new priorities when you are thrown into the unexpected caregiving role. Balance work, family your loved one and keep time for you at the top of the list. Discover how to kindle hope, love, and never ending persistence to fight the odds. The Provincial Government and City of Medicine Hat will have in attendance, MLA Drew Barnes (or representative) and Mayor Ted Clugston, who will acknowledge the key role family caregivers play in caring and supporting those with short and long term illness, disease or disability. When Lorna Scott married her high school sweetheart, she believed they would live a life of happily ever after. Go off on a honeymoon, raise a couple of children, buy a house or two, and live into their golden years basking in all the memories they created together.But that dream was cut short when her husband Callum was diagnosed with colorectal cancer at the age of forty-four. Lorna is the founder of Accelerated Success Consulting. She works with those who are ready to transform their lives, have more joy, and live with passion. She is a trainer, self-development coach, author and speaker who has worked with individuals and facilitated groups for over twenty years. Her personal philosophy is to have a positive outlook on life with a focus on solutions, not problems. She firmly believes that with the right information, attitude, focus and a belief in yourself you can achieve your highest goals.